According to TIME1 magazine, the average American will spend two to five years of their life waiting in line. At airports, waiting is a bona fide source of frustration for travellers. If there’s a way to cut down on wait times, travellers want to know – whether it’s checking in on a mobile device or priority boarding – satisfaction increases the shorter time we wait. But, there’s also an important benefit to airports themselves. When passengers are held at security, this can mean less time for them to browse and spend in the airport’s retail areas, which is an important source of non-aeronautical revenue. Finding ways for an airport to cut down on wait times makes not only financial sense, but also helps improve the overall customer experience, a priority for Vancouver International Airport (YVR). However, for many airports, staffing up or expanding to accommodate an increase in volume is not an option. It’s also not a practical way to accommodate what might be only temporary spikes in traffic, for example around major holidays and events. Fortunately, there are other solutions for improving the speed and ease of people and bags through an airport. 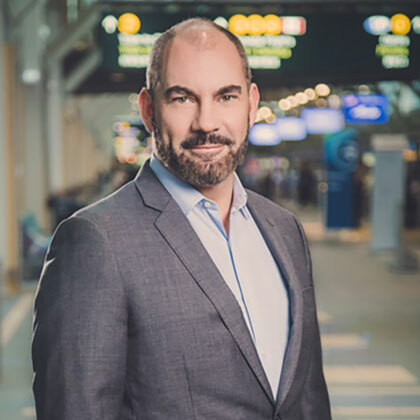 YVR – recently named Best Airport in North America2 for the ninth consecutive year – created a dedicated business unit, Innovative Travel Solutions (ITS), with a vision to finding technological solutions to these challenges. As a member of the ITS team, I’m proud to say we’ve since delivered two time-saving technologies, BORDERXPRESS and CHECKITXPRESS. Nearly a decade ago, faced with increasing wait times as passenger traffic increased, YVR partnered with the Canada Border Services Agency and later United States Customs and Border Protection to implement self-service kiosks to automate the border-clearance process. BORDERXPRESS is the world’s first self-service border control solution that accepts all passports and doesn’t require pre-registration or fees. The technology reduces passenger wait times by more than 50 per cent. Since 2009, we’ve installed more than 1,600 kiosks at 39 airport and seaport locations globally, helping more than 160 million passengers worldwide clear the border securely – more than any other automated passport control provider. In an industry where revenue hinges on mere minutes, every second counts. Kiosks have been proven to help airports process travellers, on average, up to four times faster than more traditional methods (162 per hour versus 41). At ITS, we continue to develop travel solutions that improve the overall passenger experience and airport efficiency. Recently, we turned our attention to YVR’s check-in and bag drop areas, which can see long wait times, congestion and frustration from passengers during peak periods. While there are other self-service bag drop products on the market, none are universally accessible while also being highly efficient – both of which are imperative to airport operations. YVR partnered with New Zealand-based Glidepath, a world leader in airport baggage handling systems, to collaborate on designing an efficient, secure and accessible bag drop: CHECKITXPRESS. The combination of Glidepath’s unparalleled expertise in innovative baggage handling systems and YVR’s strong track record in customer-centric design have helped create a truly unique product. The first CHECKITXPRESS self-service bag drop unit was installed at YVR in May 2018. It is the world’s most accessible, efficient and intuitive bag drop; improving ease of use for travellers regardless of their age, digital fluency, language or mobility. The system was ergonomically designed by lowering the profile of the conveyor to four inches (10cm) off the fl oor and having durable ramps to wheel bags on to the conveyor. The bag drop unit is accessible from multiple sides, offering a user-friendly experience for all travellers. This industry-first creates a more seamless and enjoyable travel experience for everyone. A priority when developing passenger-processing technology is to enhance the overall traveller experience and airport performance without compromising safety or security. Through its innovative camera technology and superior first-time read-rates on baggage, CHECKITXPRESS has achieved some of the quickest customer processing times in the industry, with first-time read-rates of greater than 90 per cent By expediting the bag-drop process, this results in a cost-effective solution to reducing passenger wait times, while taking pressure off essential airport personnel. Instead of waiting in long lines for agent assistance, passengers can check their bags in an intuitive two-step process, where the average processing time is eight seconds with no agent intervention or assistance required. Plans are now underway to expand the customisable bag drop system throughout YVR and to other airports around the world. The International Air Transport Association expects the demand for air travel to double over the next two decades. 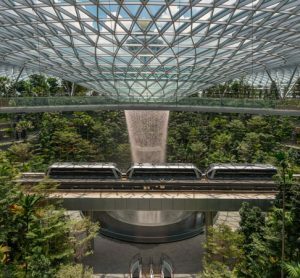 To best take advantage of the opportunities this presents, airports around the world must embrace innovation – as both a solution to increasing efficiencies and to improving passenger satisfaction. 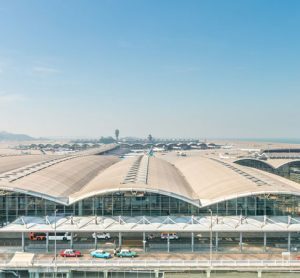 By implementing automation and technology, airports open the door for better passenger experiences. 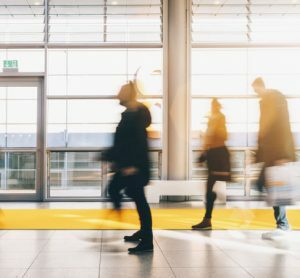 Technology that can handle the routine, yet necessary aspects of the passenger experience allows airport staff to focus on the human elements of passenger processing. Technology is changing human behaviour and shortening our patience for waiting. In some cases, airport technology isn’t advancing as rapidly as people may expect, but safety must always trump efficiency. At YVR, we take a disciplined approach to using technology. We ensure that any innovation implemented is done to improve our customers’ experience and aligns with our strategic priorities. With more than 10 years’ experience in kiosk design, user experience, layout and fl ow analysis, ITS has grown and we are setting our sights on the next innovation in the evolution of the passenger experience at airports and seaports. We seek to unite security, efficiency and innovation to keep pace with passenger growth in the travel industry. We are always looking around and looking ahead, anticipating issues before they happen. We’re exploring predictive analytics and other technologies that can help us better understand how we move people, planes and bags as efficiently as possible. We’re also thinking about how the use of biometrics can improve the overall customer journey from check-in all the way to the gate. It takes a lot of coordination and effort between government authorities, airports and private agencies to speed the fl ow of bags and people through terminals. But freeing space and personnel in an airport, increasing security, and making passengers happy is worth it. Chris Gilland is the Director of Innovative Travel Solutions, an independent business unit within Vancouver Airport Authority (YVR) with more than 10 years of experience in kiosk design, kiosk user experience, kiosk layout and flow analysis and continuous improvement for automating border control systems at airports across North America and around the world. Innovative Travel Solutions specialises in developing and delivering innovative industry-leading travel technology to enhance the overall traveller experience and airport performance.